As we drive out of Sydney and the road starts climbing towards the Blue Mountains, we keep our eyes on the car thermometer. A welcome relief in summer, the cooler temperatures of the mountains can be an unpleasant surprise on a winter hike. My friend Gaiti and I are well prepared for the adventure with the boot full of down jackets, beanies, scarves, and gloves. For now, the sun is out, the car is toasty warm and it is hard to imagine being cold. By the time we arrive in Blackheath, the thermometer shows 8.8 degrees, about 9 degrees cooler than Sydney. We make our way to the Grand Canyon Loop car park and watch the occasional hikers walk past us dressed in anything from shorts to down jackets and woollen beanies. Out in the sun, the air feels much warmer than 8.8 degrees would suggest and after some deliberation we choose the middle ground, opting for fleece jackets and leaving Eskimo fashion options in the car. Ready to start the challenging hike we look for the signs to the start of the Grand Canyon Loop track. 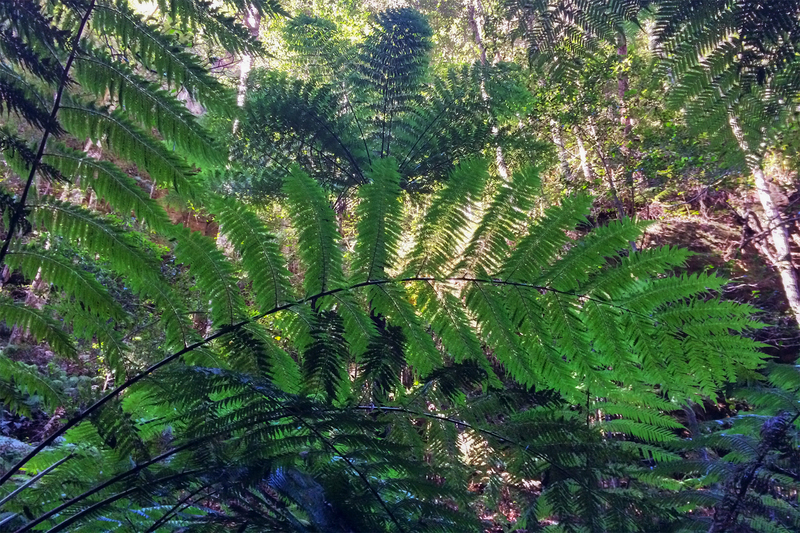 There doesn't seem to be any, so we follow the most heavily trodden path that leads to Evans Lookout. Having seen a fair share of lookouts in the Blue Mountains over the years, the prospect of seeing another one doesn't necessarily make my heart beat any faster; until I see it. 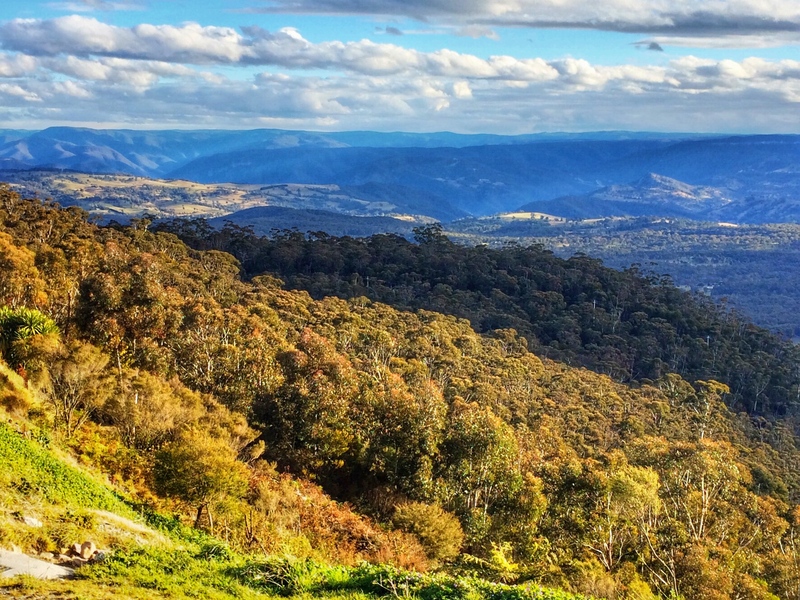 Stretching across 180 degrees, the view from Evans Lookout sweeps over the top of the escarpment and the deep fold in the landscape that forms Gross Valley with the winding line of the creek running across the vast valley floor. The creek seems unimaginably far away, but I know that part of the track we are about to start runs alongside it. With a touch of apprehension, we set out on the journey to the bottom of the Grand Canyon. From the start, the trail runs through a dramatic pass in the rock and continues downhill via sets of wooden and stone steps. It runs through a gap in the cliffs and across wooden bridges descending ever deeper into the canyon. "What goes down must come up", teases Gaiti, pulling me out of my day dreams about lost worlds and pre-historic creatures. Ironically, as much as I love wilderness areas, I am not a fan of steep uphill climbs. They make me feel like my chest is burning with hell fire and my legs turn into molten rock. But for now, it is all downhill. I choose not to think about the other side. Soon we find ourselves in a narrowing chasm. 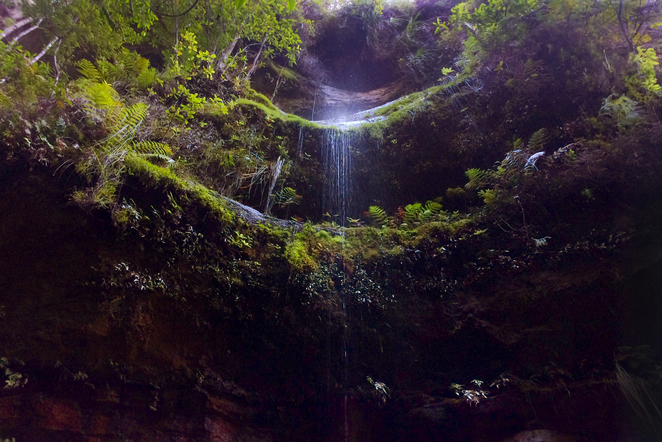 It is the world of ancient ferns, dim light, and trickling water. We have reached the floor of the canyon. The walls of the cliffs are so high, we can barely see where they end. From this low perspective, I get a keener sense of the mammoth scale of the landscape around me than I did from the cliff top lookout. I think of the millions of years that it took nature to carve out this canyon, and my daily worries simply dissipate in the face of such vastness. It was this stretch of the of the walk that attracted me to the Grand Canyon track in the first place. The trail winds alongside the creek, crossing it every so often. 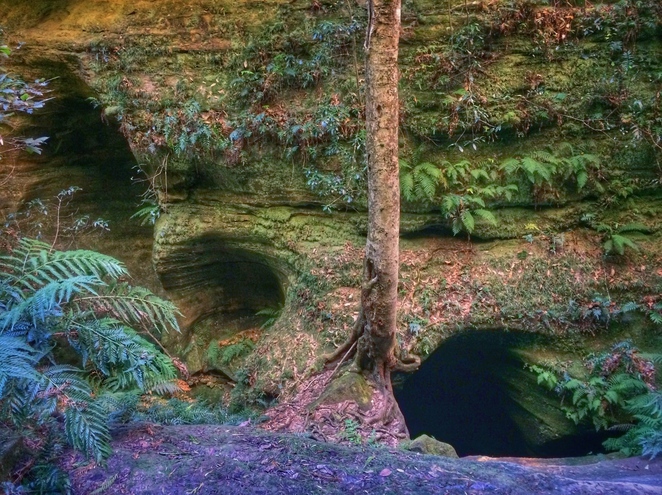 This enclosed passage is a treasure chest of hidden nooks and crannies, tiny waterfalls, picturesque pools, fallen tree trunks and concealed gullies. I get lost in this wonderland, while Gaiti forges ahead keen to see how quickly she can complete the 6.3-kilometer track. After a while, the trail starts to climb back up. The initial ascent is not too long, but it is hard work. Before long I feel like I am boiling underneath the layers of clothing, although my ears and nose are still cold from the exposure to cold air. As I climb a steep set of stairs and feel my lungs beginning to burn, I see Gaiti perched on a rock on the side of the trail, having a snack and looking fresh as a daisy. I plonk myself next to her and for a while try to catch my breath. By the time my senses return, Gaiti is off to power up another set of gruelling steps, satisfying her Capricornian traits. In stark contrast to me, stairs make her happy. Left to my own thoughts, I imagine the hardships that the builders of this trail faced. The Grand Canyon Loop track first opened to the public in 1907. To put this in perspective, it was before the Communist Revolution in Russia, before the fall of the Ottoman Empire and certainly before the days when helicopters would deposit pre-processed sandstone blocks along the trail. This very steep trail was built with nothing more than shovels, crowbars, and dynamite. My job of simply walking the trail now feels like a piece of cake. Having climbed about half way to the top of the escarpment the trail evens out and continues along a dramatic claystone ledge, looking down into the canyon from above. 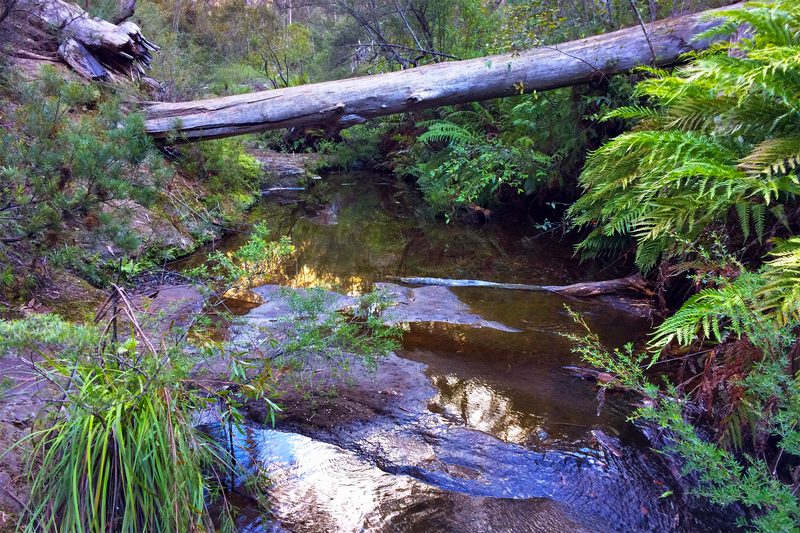 I remember reading in the guide book that the creek could be as far as 30 meters below me now. Further up the trail, I walk past an anchor point where heavy chains are wedged into a large rock beyond the trail's railing. This is the entry point for abseiling into the canyon, but today there are no climbers around. Listening to the trickling sound of running water, I try to see the creek below, but it is concealed by the overhanding ledge. I am so intent on catching a glimpse of the canyon floor again, that I barely pay any notice to the trail. 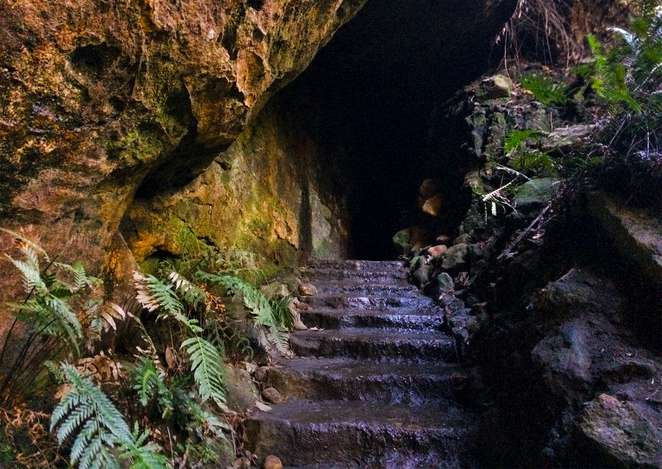 When I look up, I am surprised to discover that the path ahead runs straight into a pitch-black cave. There is not another soul on the trail and I feel like a true explorer as I step into complete darkness. The darkness, however, only lasts a couple of steps and almost straight away I see the light on the other side – the tunnel turns out to be very short. From the tunnel, the trail continues to run over relatively flat ground, but soon I start getting glimpses of the formidable walls of the escarpment through the breaks in the canopy. Today they are my Everest. 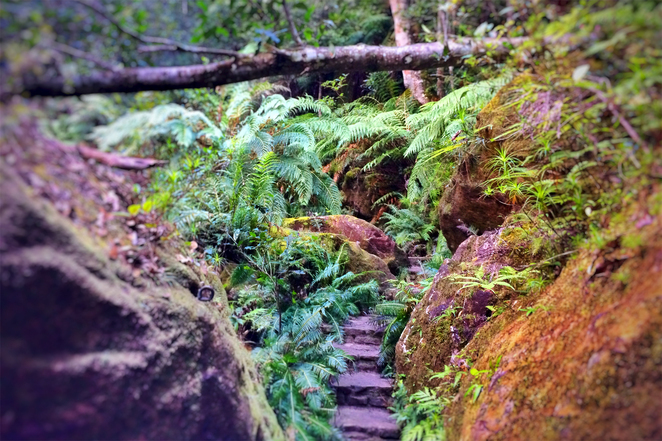 I mentally brace myself for the climb as the first set of wooden steps appears on the trail. For the next few hundred meters the stairs alternate between the gentle wooden steps and the steep stone ones. After about 10 minutes I feel my heart pumping in my ears. It seems to beat incredibly fast as if it is trying to break out of the confines of my chest. Each time the path disappears out of view behind a bend, I feel that this must certainly be the last lot of stairs. Each time I'm wrong. The serpentine climb feels to go on for ever, even though I know that the trail ascends no more than 350 meters. Thankfully, the view from the top is quite spectacular. I spend an inordinate amount of time admiring it, as I stop to catch my breath every 20 or 30 steps. 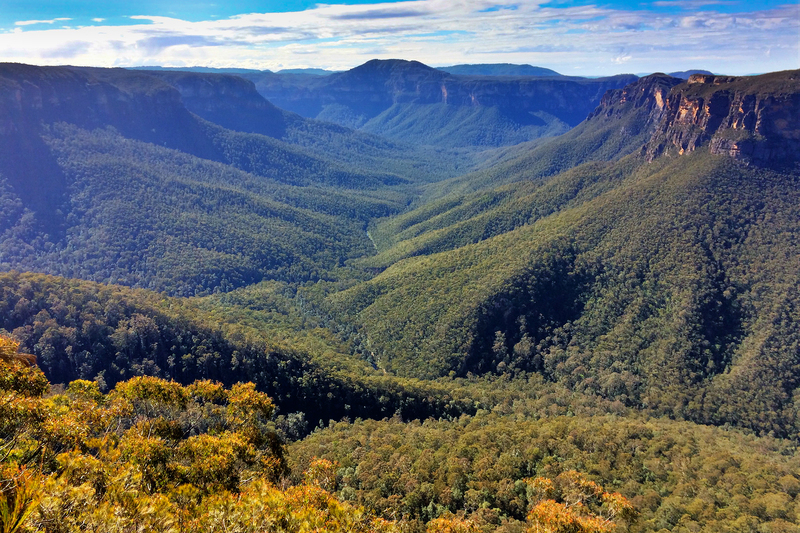 The lush carpet of green forest undulates over the mountains, broken by the patches of yellow and orange sandstone outcrops where the top soil has weathered away. 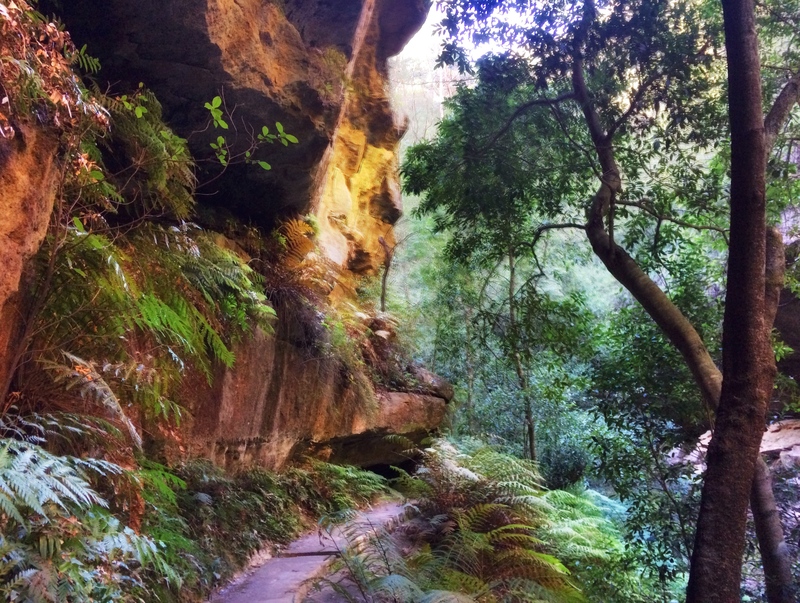 I soldier on up the steps and suddenly without warning, without any gradual change of scenery the trail ends and I emerge at a car park, 1.4 km away from Evans lookout. Surprised, I feel a flood of conflicting emotions. The sense of accomplishment from summiting my 350 meter-high Everest is offset by a tinge of disappointment that the trail ended sooner than I expected. At my dawdling pace, I completed the walk in just over 2 hours, while the guide book suggested 3.5 hours. I follow the signposted trail to the car park, grateful to be on a flat stretch for a change and by the time I arrive, Gaiti has unpacked the thermos and we indulge in a deliciously hot cup of tea. The sun has now sunk lower in the sky and the weather turned quite chilly. On the drive back, we stop for a cup of coffee at the white-walled fortress-like Hydra Majestic Pavilion. The shop inside is full of rustic country charm – the perfect atmosphere to rest our weary feet after an eventful day in the mountains. Turn right off Great Western Highway into Evans Lookout Road near Blackheath. Continue along Evans Lookout Road, following the signs to Evans lookout. Park either at Evans Lookout car park or at Grand Canyon Loop car park. The Grand Canyon Loop car park lies between the start and finish of the track. Great article! Enjoyed reliving it through your perspective! Loved the pictures. The last one, especially, is a superb shot. Well done Margarita! !